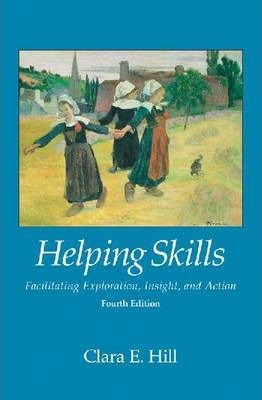 This fourth edition of Clara Hill's popular textbook updates her comprehensive exploration of basic helping skills for undergraduate and first-year graduate students. Hill's three-stage model of helping clients involves exploration, insight, and action. The exploration stage helps clients explore their thoughts and feelings. The insight stage helps clients understand the reasons for their thoughts and feelings. The action stage helps clients make desired changes in their lives. Authoritative but highly accessible, the book describes the goals and theoretical foundations of the three stages, how helpers can learn and practice the skills used in each stage, general principles for ethical practice, and important cultural issues. Hill also challenges students to think about and discuss the process of becoming helpers and their reasons for doing so. The Instructor and Student Resource Guide Website will also be updated. The instructor section of the website is restricted to instructors only and includes sample multiple-choice questions, essay prompts, and syllabi for undergraduate and graduate courses. The student section of the website is available to all users and includes practice exercises (for individuals), lab exercises (for lab groups), and helpful forms. Two companion DVDs illustrate and provide commentary on the three-stage model of helping: Helping Skills in Practice and Dream Work in Practice. Please note that the DVDs are not available on an examination or desk copy basis for course adoption. The DVDs are available for purchase only. Clara E. Hill earned her PhD at Southern Illinois University in 1974. She started her career in 1974 as an Assistant Professor in the Department of Psychology, University of Maryland, and is currently still there as a Professor. She has been President of the Society for Psychotherapy Research, Editor of the Journal of Counseling Psychology, and co-editor of Psychotherapy Research. Awards include the Leona Tyler Award from APA Division 17 (Society of Counseling Psychology), the Distinguished Psychologist Award from APA Division 29 (Psychotherapy), the Distinguished Research Career Award (Society for Psychotherapy Research), and the Outstanding Lifetime Achievement Award (Section on Counseling and Psychotherapy Process and Outcome Research, Society for Counseling Psychology). Her major research interests are helping skills, psychotherapy process and outcome, training therapists, dream work, and qualitative research. She has published 187 journal articles, 67 chapters in books, and 11 books (including Helping Skills, Dream Work in Therapy, Insight in Psychotherapy, Transformation in Psychotherapy, and Consensual Qualitative Research).